The memories are still raw. India had been handed their second consecutive drubbing on overseas tours, and while the disastrous England tour could be blamed on the pitches and unfortunately timed injuries, it was much harder to find excuses for the thrashing down under. In the end, the 2011/12 Indian tour of Australia ensured the exits of two stalwarts and left a bad taste in the mouths of Indian fans. 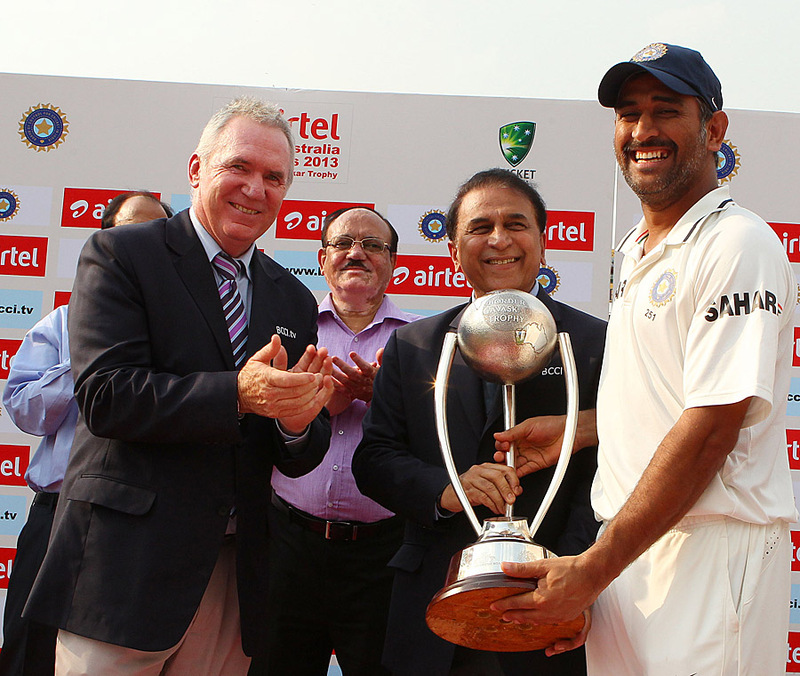 When February 2013 came, there was still a bit of trepidation among Indian fans as the Australian team arrived for the return series. Harbhajan Singh proclaimed, to much derision, that India would win the series 4-0. At that point, scarred by a home series loss to England, most fans would have taken even a 1-0 win. One month later, Bhajji’s words have come true; and the only object of derision is the Australian team, who have unraveled spectacularly in the last few weeks. Home series wins are nothing new for the Indian team; but in the context of performances over the past two years, and given the influx of inexperienced players in the squad, the 4-0 battering of the Australian team has come as balm to many fans who have weathered some horrible months recently. While there has been talk of ‘transition’ for a while now, this series has truly been the ‘turning point’ for the team, as they learned to win without major contributions from Sehwag and Harbhajan, and in the absence of Gambhir and Zaheer. The likes of Sehwag, Harbhajan and Zaheer might have played their last Tests, and another legend from Mumbai may be on his way out shortly. In fact, this series was won by four youngsters, who entered this series with contrasting reputations and differing routes to the team, but have now firmly entrenched themselves as the foundation around which the Indian team can chart new paths and create a new blueprint for success. When Murali Vijay was retained in the squad for the Australian series, his pick was met with a a mixture of outrage and skepticism. Apart from bright performances in the two Irani games book-ending the Ranji season, his records for the year didn’t indicate that he deserved his spot. Sure enough, his dismissals in the series opener at Chennai increased the chorus of murmurs against him. What followed was an exercise in self-restraint and determination as big tons in Hyderabad and Mohali, followed by a gritty half century in Delhi proved that he has it in him to excel at the highest level. He showed a willingness to curb his attacking instincts and do the job of a traditional opener – See off the new ball, settle down and then unfurl the full range of shots . There were times when Dhawan and Pujara got going, that he could have been tempted to accelerate as well. Instead he showcased his new-found maturity by providing able support and never relinquishing the initiatives to the the Aussies. He won neither the Man of the Series or any of the Man of the Match awards, but he ended up as the highest run-getter on either side and showed pessimistic fans that there is life beyond the famed Delhi opening combination. They said that it is not easy to replace a mountain of experience or tons and tons of runs in Test cricket overnight. Well, I present to you Cheteshwar Pujara. 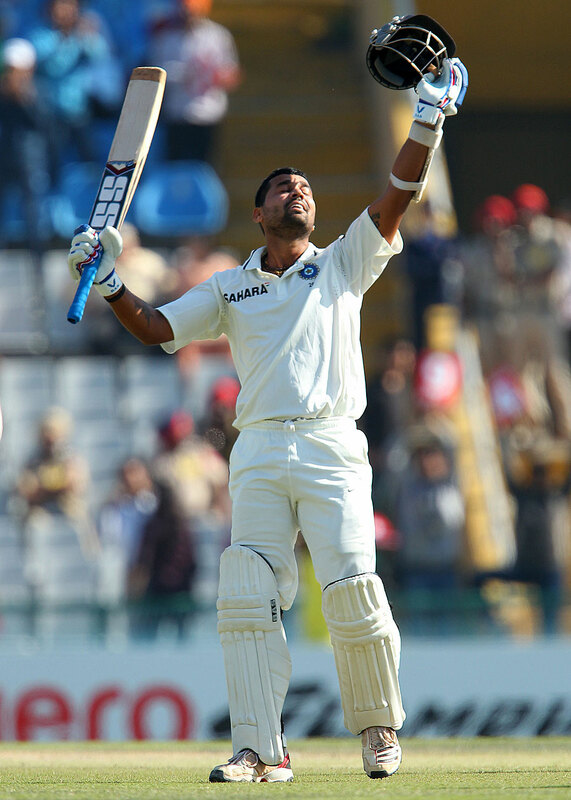 In a span of three consecutive Test series, he has proved more than an adequate replacement for one Rahul Dravid. He reeled off a double century in Hyderabad to establish complete dominance over the Aussies, but his finest innings was the authoritative 82 he scored on a tricky pitch in Delhi as an opener to take India to an unprecedented 4-0 nil whitewash of the opposition. Bigger and tougher challenges await, but I suspect that India have found the perfect man for all occasions. I will put my hand up and admit that I was one of many who was shocked with Ravindra Jadeja’s elevation to the Test squad in the series against England. He seemed to be a perfect limited overs player. He could add some valuable runs with the bat, pick a few quick wickets with the ball and field brilliantly; but he was definitely not Test material. Or so many thought. Instead, he ended the series with 24 wickets, making the finest Australian batsman his bunny and produced several acts of fielding brilliance, which the Indian Test team has lacked for years. With the bat, he didn’t score any big knocks but he calmed Indian nerves with a couple of lusty blows in Mohali and got a very valuable 40 in the first innings in Delhi. For the long run, he provides Dhoni with a lot of options when it comes to team balance. He could yet turn out to be the all rounder India desperately craves for in Tests. 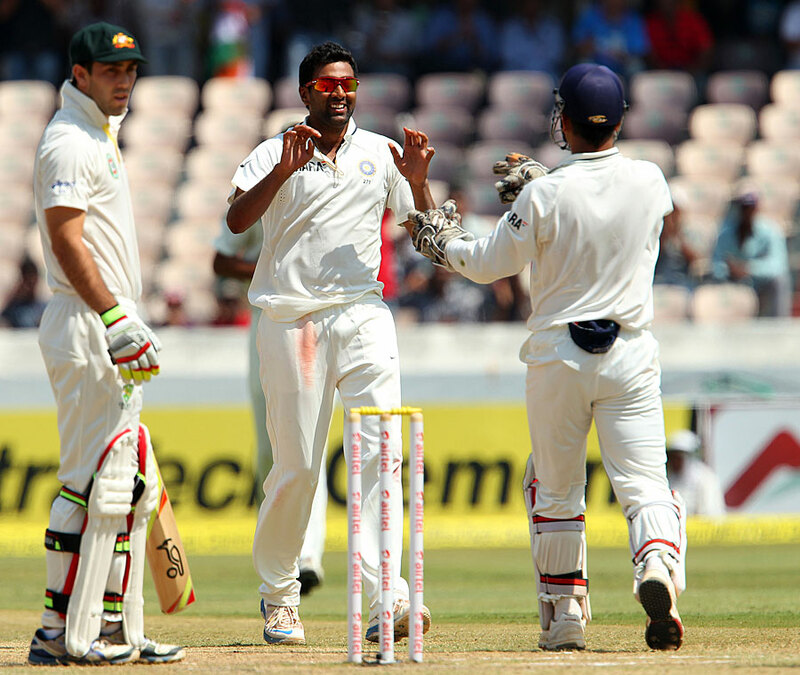 Ravichandran Ashwin came into this series with a bit of pressure on him. Two poor series against Australia and England, coupled with the rising Ojha and returning Harbhajan meant that the mantle of leading spinner was at stake. He had been working with his bowling coach prior to the start of the series and it showed in his first over of the series. He bamboozled the Aussie openers for a while before cutting through the top order. From there, he never let off. Shelving his infamous variations and bringing it out liberally, Ashwin deceived the batsmen with traditional off spin and ended up as the leading wicket taker and bagged the Man of the Series award for the third time in five series. With this performance, he may have effectively quelled the career of Harbhajan Singh and re-established himself as Dhoni’s leading strike bowler. The Aussie Annihilation: A Lazy Analysis !